SVP is the new jewellery brand by designer Sarah Parham. Handcrafted in solid silver and 20 carat gold vermeil using semi-precious gemstones, these are rings specifically designed to fit every finger – and they look amazing front and back. Fitting super petite digits right the way through to the XXL, SVP rings bring luxe jewellery to everyone. Know that sad feeling when you fall in love with a ring and you can’t have it as your size isn’t available? That never happens with an SVP ring. The adjustable band makes them great for gifting and even better for self-gifting. The ranges are made to be interchangeable, too, so choose how you wear your SVP rings, stacked up or solo, mix and matching colours and gem sizes as you wish. 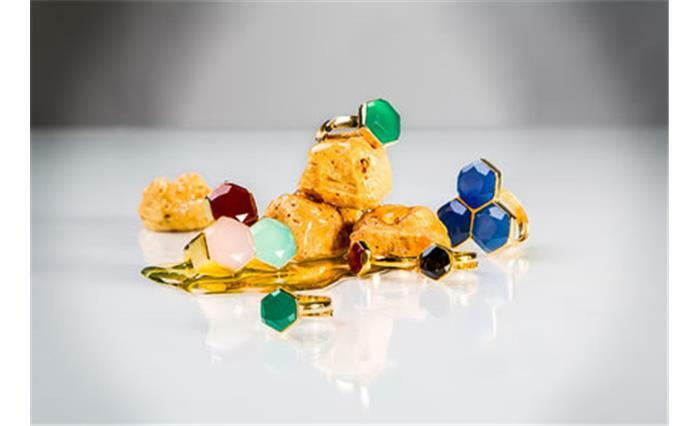 The first launch collections include the Bonbon and the Honeycomb. The Bonbon ring comes shaped like a sweetie in three gemstone sizes to stack up or wear solo. Prices start from £99 and range from rich creamy Moonstone to deep Dyed Emerald, the pale beauty of Citrine to confectionary pastel Pink Chalcedony and cocktail hour favourites, Mystic Topaz and Blue Sunstone. Honeycomb rings are hand cut hexagonal gems that range from the perfectly cut petite gem to the ultimate showcase collection piece in specially dyed quartz. SVP is available online at svpjewellery.com. UK retailers already include award-winning Nola – Brighton, Neilson – Cuckfield, Art Wednesday – online, Bishop Philpott – Cornwall, Concrete Catwalk – Essex, Black White Denim – Cheshire, Sirene – Aberdeen, Cameron Contemporary Art – Hove. Next articleKara Jewellery: Bazaar Love Continues since three generations….